What is the Link between Heart Disease and Periodontitis? Gum disease is a growing condition in the US and many patients who have gum disease are unaware of it until they go in for a dental checkup. Periodontitis is considered to be the severe form of gum disease and develops after gingivitis is left untreated. 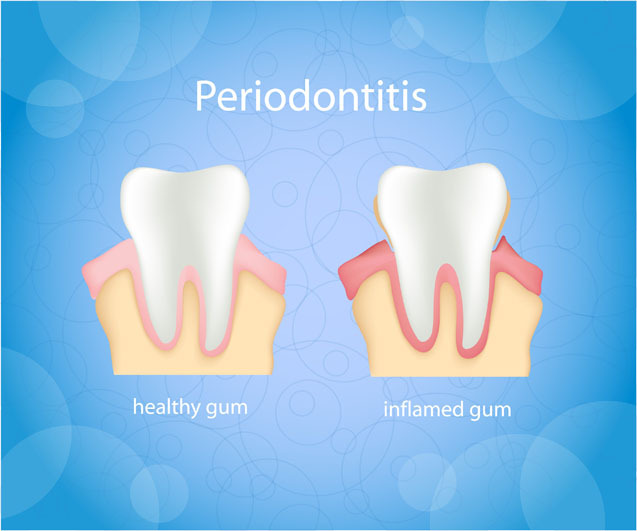 Periodontitis can cause serious complications with your teeth and gums including bone loss, tooth loss, and more. In addition to tooth loss, periodontitis can affect your heart and leave you at risk for heart disease. Studies that have been performed show a strong link between gum disease and heart disease. It has also been shown that gum disease can cause heart conditions to flare up or worsen over time. Scientists believe that bacteria enters into the bloodstream by the mouth and is then carried throughout the body. The bacteria in your bloodstream ends up in your arteries and will stick to the plaque inside. In addition, scientists believe that the infection in the gums causes the red blood cells to become wider and larger, which then makes it difficult for the cells to move around freely leading to blood clots and blockage. Once the infection is gone then the blood cells return back to their normal size. Gum disease can be controlled with proper brushing and flossing at home. If you do not brush your teeth regularly, you need to get into the habit of doing it. In addition to brushing, you should visit your dental care provider on a regular basis to have your gums checked and your teeth cleaned to prevent infection. If you do have periodontitis, your dentist will typically give you medication to heal the infection. You may need oral surgery to correct the problem as well. Although there is no hard data to support the exact link between gum disease and heart disease, why take your chances?